As our community ages, maintaining, enhancing and adding to our infrastructure, facilities and amenities is a must. The Montgomery Village Foundation Board of Directors is dedicated to keeping the Village a desirable, flourishing community in the Washington, D.C. metro area. Use the below links for information regarding current development and projects in and around Montgomery Village. The Apple Ridge Pool was renamed the Peggy Mark Pool and opened for the 2017 season for all residents to enjoy! The new “leisure” pool features a “lazy river” or current channel; an open body slide; a double family slide; water features including dump buckets and pipe falls; spray ground; beach entry; in-water sun-shelf lounging area; an underwater bench sitting area with cool water jets; a bridge to an island pool deck; and an ADA compliant access ramp. Additionally, the wading pool will feature a beach entry and water features suitable for younger pool-goers. Atlantic Realty Companies (ARC) purchased the Village Center in December 2015 and has been very busy planning for the future of the site. On April 26, the Planning Board approved Atlantic Realty Companies’ (ARC) plans to renovate and add some retail density and new housing to the 18-plus acre property. This plan includes 49 townhouses, 34 two-over-two condos and 32 condos/apartments, but only the 32 condos/apartments are included in the Site Plan, for which ARC received approval from the Planning Board. The remaining housing units will be included in a future Site Plan for the property. 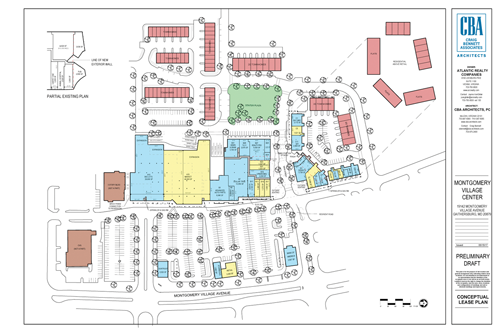 The retail redevelopment will be phased in and will include the creation of three new pad sites on the front of the property and the extension of Centerway Road through to Watkins Mill Road, which creates a connection between the residential development and new retail. Atlantic Realty Companies (ARC) recently received their Certified Site Plan to proceed to building permit to build new pad sites along Montgomery Village Avenue, perform façade improvements, extend Centerway access road to the rear of the shopping center, build apartments above the retail across from the rear of the McDonalds and build the public green space at the rear of the shopping center. The county has informed MVF that ARC has applied for a minor amendment to the preliminary plan and site plan to allow for minor changes to the foot prints of the pad site buildings to accommodate tenants needs. Bank of America will be relocating to the old Village Café location while a new pad site is constructed for them, and it has been reported that Aldi will be the grocery store anchor for the site and be located next to Big Lots. According to the Montgomery Newsletter, it has been confirmed that German grocer, Lidl, has finalized a purchase of the Professional Center property. Lidl representatives have noted that they are working on a site plan and will be working with the community before submitting anything to Montgomery County. By way of background, there is a covenant on the property that limits the amount of retail allowed on the site and Lidl says they will be under the 30,000 sq. ft threshold. In preparation for the Gaithersburg East Master Plan, later separated into the Montgomery Village Master Plan, which Montgomery County originally set to work on in 2014, the MVF Board of Directors appointed the Vision 2030 Steering Committee to work with a professional land use consultant to: 1) develop a general vision statement that would articulate the community’s vision and would influence the county’s master plan update; and 2) hold a number of charrettes to get residents’ and others’ input on how to change, improve or enhance various areas of Montgomery Village. A series of three, two-day community charrettes were held, and various land use options were developed for each site. Feedback during the charrette process demonstrated that the community recognizes the need for change and that there needs to be an infusion of new high quality development, both residential and commercial, as well as updated public facilities in order for Montgomery Village to maintain a sense of community and serenity in an ever urbanizing county. Questions such as “How do we make things more attractive, fresh and vibrant?” came up over and over, as residents and professional planners shared ideas and in some cases, drawings for various areas of the Village. “How do we strengthen our sense of community? How do we increase property values? What kinds of housing or commercial facilities do we need?” The committee identified four sites in the Village that will be ripe for redevelopment in the next 20 years. Concept plans were developed for each location and then presented to the MVF Board of Directors, the Montgomery County Council and the Montgomery County Planning Board. By way of background, the Planning Board approved a resolution on December 20, 2017 formalizing their vote earlier in the month approving a Site Plan that includes 494 housing units (26 single family homes, 2 duplexes and 466 town houses) in six areas of the former golf course. The plan includes a new park for MVF and a large stream valley park, which may eventually be conveyed to M-NCPPC. The Planning Board’s comments to the Preliminary Plan of Subdivision and Site Plan have all been addressed and were approved by M-NCPPC Staff in May 2018. The PFA was executed by M-NCPPC in July 2018, and the county has now processed the certified plans, which completes the entitlement process for the project. Development Manager for Monument Realty Yovi Sever gave a detailed report on the status of development planning and construction to about 50 members of the MVF community at the North Creek Community Center on Tuesday, Oct. 16. Sever reported that following the site plan approval by the Planning Board, they have continued to work on a refined engineered plan so that they can submit a record plat and apply for various site and building permits no later than early 2019. He reviewed the approved site plan, noting the six areas where housing—mostly town houses of varying widths—will be built. He noted that Areas 4 and 5 will be phase one, with other phases being finalized as construction progresses. It estimates that it will take 18 to 24 months to build out phase one and projected an overall buildout of five years for the project. Sever discussed the housing sizes and price points for the homes, which range from 16’ x 42’ (approx. 1,350 sq. ft.) rear-loaded townhomes, 20’ x 42” (approx. 1,500 to 1,600 sq. ft.) rear-loaded townhomes and 22’ x 42’ (approx. 1,700 to 1,800 sq. ft.) front-loaded townhomes. Price points for market rate units are expected to bring a price of the mid to upper $300,000 to mid $500,000 for largest units. He noted that the home builder(s) they are working to contract with to build the homes believes that the market is ripe for what is referred to as the “missing middle home” that offers home buyers an alternative to much higher priced homes in the county. In addition, he noted that a decision had been made, in consultation with the prospective home builder, to increase the number of MPDUs from 13.8% to 25%, bringing the total number of MPDUs in the project to approximately 125 out of the approximately 500 total units. County law allows the increase in MPDUs, the goal of which is to create more affordable housing for moderate income residents, such as teachers, police officers, entry level private sector and government workers, etc. The additional MPDUs would be created by reducing the number of 20’ townhouses and increasing the number of 16’ homes. For instance, if a stick of eight 20’ townhouses were to be converted to 16’ townhouses, this could yield two more MPDUs. The MPDUs would be indistinguishable from any market rate unit and would be dispersed throughout the community. Owners must qualify for a mortgage, cannot rent the homes and at resale, the price of the homes would be controlled by county guidelines. The goal is to keep the units in the affordable range. Sever also discussed the dedication of land and buildout of Central Park to Montgomery Village Foundation, which must be constructed prior to occupancy of the 150th residential unit. 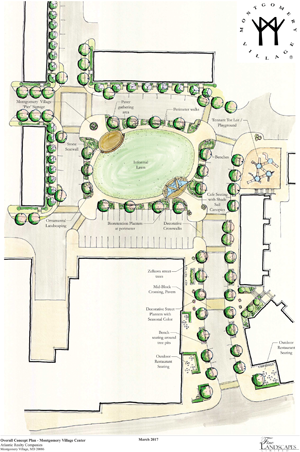 The park will include a dog park, community gardens, a playground and trail system. There was much information shared about the restoration of the stream valley park, which connects Lois Green Conservation Park and Great Seneca Park. Sever mentioned that they are very close to executing an agreement with a conservation organization to improve the condition of the stream valley, plant trees, etc. Once the conservation organization completes their work, pursuant to a Parks Facility Agreement (PFA), Monument will dedicate 47 acres of stream valley to the Montgomery County Parks Department. Sever noted several key steps to starting construction, including finalizing a contract with the builder: the record plat submission, which would be reviewed by a number of county agencies over a 3 to 4 month period; permit applications, which would entail a couple month review by county agencies; and ground breaking in fall/winter 2019. Following the presentation, there were a number of resident questions, including: preservation of existing trees buffering existing homes from the new development; timing of the Parks Facility Agreement and whether it was a condition of the site plan; removal of the old golf course fence, and if new fences would be installed between existing homes and the new development; how new home values would affect existing home values; whether the extension of Stewartown Road is part of the development plan; whether there would be additional traffic control on Montgomery Village Avenue, based on the number of units to be developed; would there be adequate parking, given Montgomery Village’s ongoing parking problem; whether there would be a benefit to Monument if they increased the number of MPDUs for the project; and finally, if the Parks Facility Agreement would require and inventory and protection of wildlife. For more information on Bloom, visit www.bloominmv.com/home. On February 9, 2017 the Montgomery County Council unanimously adopted the Montgomery Village Master Plan. Over the last two years, the Montgomery Village Foundation (MVF) Board of Directors, MVF staff, Village residents, county planners and business stakeholders in the Village, including Monument Realty, worked to provide feedback and comments on the proposed plan. County Council President Nancy Floreen thanked all who participated, noting that MVF and the Vision 2030 Plan helped lay the groundwork for this totally new Master Plan. The comprehensive re-zoning of all properties in Montgomery Village continues to be processed by the county council. The Planning Board has recommended all the zoning recommendations in the recently adopted Montgomery Village Master Plan and the overlay zone. MVF Board President Pete Young presented testimony on behalf of the Board at a public hearing during a county council meeting, endorsing the zoning proposed in the master plan, including the overlay zone. The testimony on Sectional Map Amendment (SMA-H-112). For more information or to view the Montgomery Village Master Plan, visit www.montgomeryplanning.org/community/montgomery_village. Montgomery Village Avenue is the dam for Lake Whetstone. It has an internal drainage system to collect and filter seepage, which occurs in all dams. Modern earth embankment dams, like Lake Whetstone Dam, are designed with internal drainage features to collect seepage passing through the dam. Uncontrolled or unfiltered seepage creates dam instability and concern for dam health and function. Therefore, assurance of the proper performance of the dam internal seepage collection system, including its toe drain, is critical for the stability of the dam. Montgomery County Department of Environmental Protection (DEP) conducts routine inspections to Lake Whetstone and its dam. Recent inspection has found Lake Whetstone’s toe drain pipe has corrosion. DEP has retained Gannett Fleming, Inc. to evaluate Lake Whetstone Dam internal seepage collection system. This evaluation is the first phase of the toe drain repair project. Drilling on the crest and slopes of the Lake Whetstone Dam will start soon, pending on approval of the Maryland Department of the Environment. Among the MVF Board of Directors recent strategic goals is reducing energy costs and carbon footprint through green initiatives. This is not only environmentally friendly, but helps free up resources for other important initiatives. The Architectural Review Board regularly approves the use of solar panels on homes, and reviews new, efficient exterior home products for use in the community. The Committee on the Environment (COE) looks at ways to reduce our impact on the environment, while maintaining a balance with wildlife. As such, a sub-committee of the COE was formed to study the effectiveness of adding solar panels to MVF facilities. This group spent 10 months researching information on the feasibility of installing solar panels on various building owned by MVF. 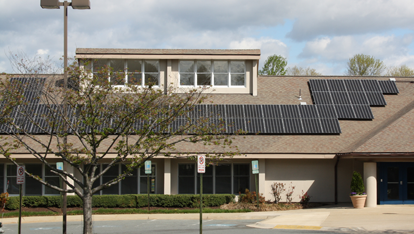 As a result of their hard work, the Committee on the Environment and the MVF Board decided to install solar panels on Lake Marion Community Center (LMCC), with the possibility of adding other facilities in the near future. About 300 solar panels were installed on the roof of LMCC, sending collected solar energy through nine inverters, helping to power LMCC. This project was approved by the MVF Board in 2014 and after permitting and installation, was ready for Pepco to turn on in mid-July. Through a Purchase Power Agreement with Paradise, MVF is projected to save $250,000 in energy costs over the next 25 years. A display kiosk inside LMCC monitors real-time power usage, savings and other comparisons. The monitor shows items such as how much energy was produced on a daily basis, how much energy has been used and other useful information including the weather. 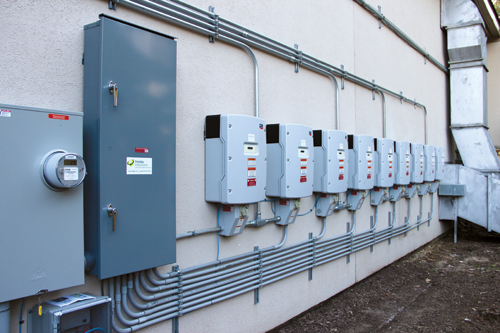 The system produces a portion of the electricity used at LMCC. In addition, to further reduce energy costs, the community center will be receiving all new LED lighting. After monitoring the success of this facility, MVF plans to duplicate it at other facilities, building commitment to the future of Montgomery Village. The following information is provided by the TAME Coalition regarding removing M-83 from the Montgomery County Highway Master Plan. MVF staff continues to monitor transportation projects that are important to Village residents. The Watkins Mill Interchange project started in Summer 2017, and regular construction updates are provided on the MD State Highway Administration (MSHA) website. According to the project manager, current work on the project includes: the completion of work on Pier #1 on southbound I-270; WSSC waterline testing; the completion of the footer for Pier #3 on southbound I-270; pile driving for Pier #4 on southbound I-270; and box culvert and backfilling work on the project also continues this summer. The project is now 34 percent complete. Progress permitting, the entire project should be complete by late Summer 2020. The Maryland Department of Transportation (MDOT) announced the Traffic Relief Plan to reduce traffic congestion, increase economic development, but most importantly, enhance safety and return quality of life to Maryland commuters. This announcement goes hand-in-hand with the State’s determination and commitment to deliver state-of-the-art transportation solutions to Maryland residents. To help address some of Maryland’s transportation challenges, the Traffic Relief Plan will incorporate many projects around the state by providing a “system of systems” for users including improvements to highways and transit. The largest initiative in the Traffic Relief Plan will evaluate improvements in the I-495 and I-270 corridors, which will consider transformative solutions to address congestion along these highways in Montgomery, Prince George’s, and Frederick Counties. 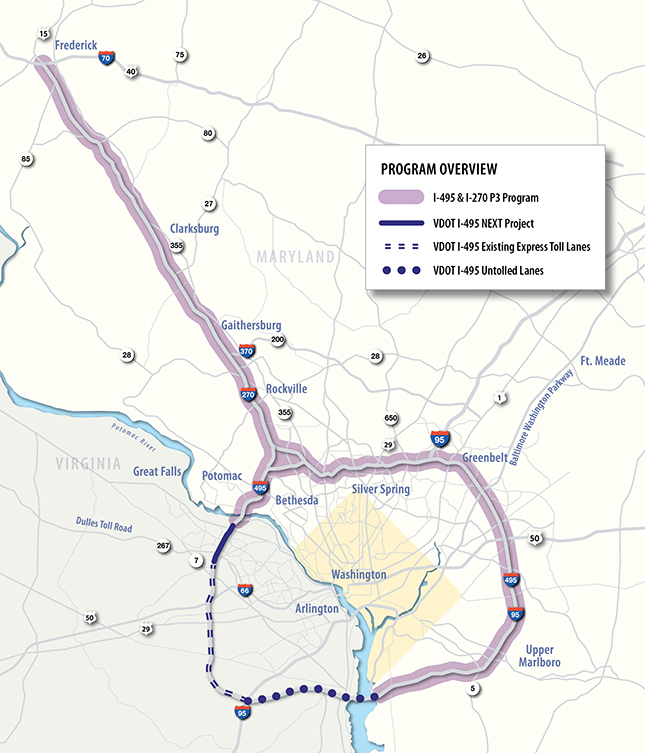 The I-495 & I-270 P3 Program is a historic effort to reduce congestion for millions of Maryland drivers by seeking input from the private sector to design, build, finance, operate, and maintain improvements on both I-495 and I-270. Improvements will be focused to transform these overloaded interstates to allow people to reach their destinations faster and to remove overflow traffic from the local roads.